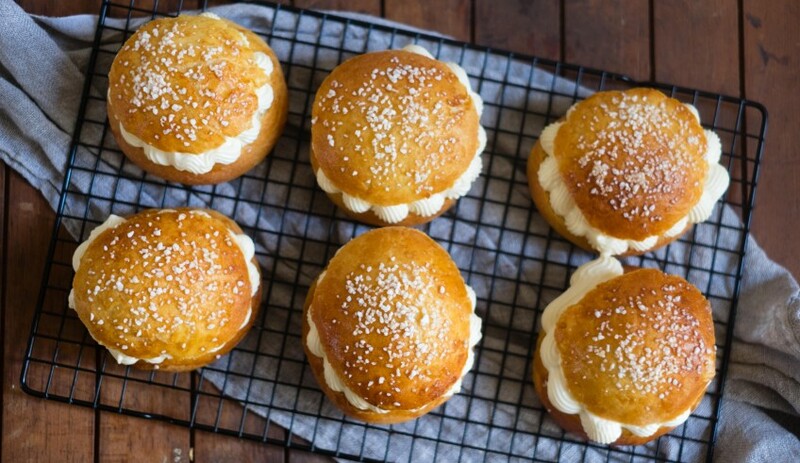 Said to be Brigitte Bardot’s favourite treat, the tarte tropezienne is a brioche bun with a creme filling that has a closely guarded recipe. Created by Alexandre Micka in 1955, Bardot was said to eat the brioche regularly and encouraged Micka to give the dessert a proper name. Inspired by the town in which it was created, the tarte tropezienne was born and is now replicated all over France, not just in St Tropez. I took Edd Kimber’s recipe from Patisserie Made Simple. This is a fantastic book and if you want to start making patisserie for the first time, I really recommend this book. The only change I made was to add a hearty dollop of salt and pepper caramel to the centre of the buns along with the creme. 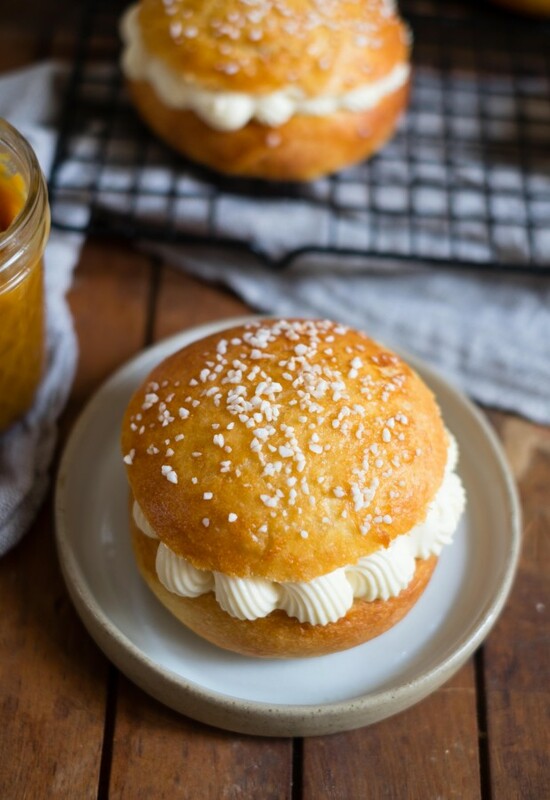 You can of course leave this out and just fill the brioche with the creme legere. I used my standard salted caramel recipe, but added some crushed black and pink peppercorns to the mix, add it to taste, but be careful not to burn your tongue. This recipe doesn’t really need any special equipment, you will need pearl sugar for the topping, I got mine from Ocado, but it’s readily available online. 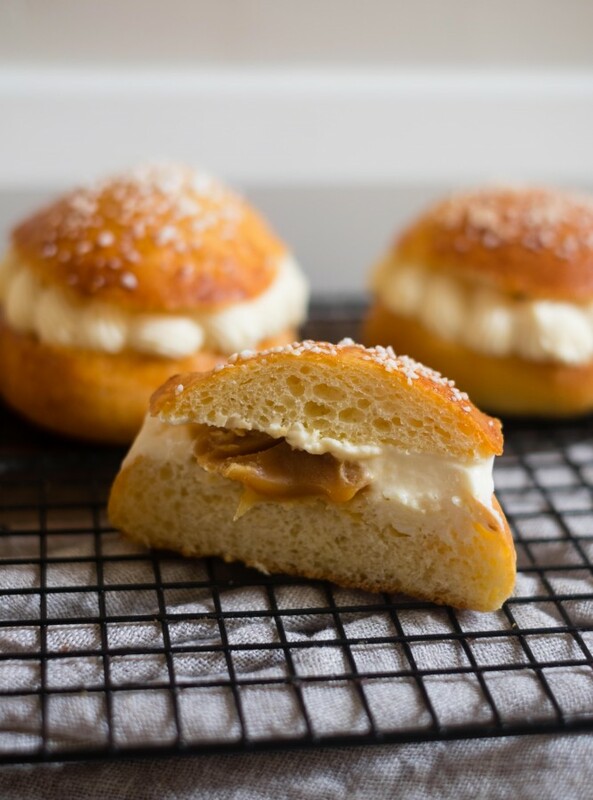 It’s not essential, but it adds a really nice crunch to the finished brioche. Tarte tropezienne is traditionally made in a large cake, but smaller versions like this have also become common. Also making mini versions gives me a chance to practice my piping, which needs some work! When making the brioche, persevere with adding the butter, don’t be tempted to speed up the mixer to incorporate the butter more quickly. This has the opposite effect and smooshes butter all round the side of the mixer bowl and not into the dough. Keep mixing on a low speed and slowly the butter will be blended in. Trust me, I’m an impatient person and I have learnt this lesson, it’s no quicker. On a separate note Patisserie Makes Perfect has had it’s first ever blog award nomination. Great British Food Magazine‘s editorial team have picked my blog as part of the ‘Best Food Blog’ category, sponsored by Debbie and Andrew’s. If you enjoy my blog and you feel like voting for me, visit here to vote. As an added extra for voting, you can also enter the competition tied to the event to win a share of £5000 worth of prizes. That’s enough self-promotion, if you’d like the recipe for the Tarte Tropezienne, here it is below. Put the flours, sugar and salt in the bowl of your mixer fitted with the dough hook and mix to combine. Put the milk and yeast in a jug and mix together until the yeast has dissolved. Pour the mixture into the mixer followed by the three eggs. Turn the mixer on to low and mix until a rough dough is formed. Knead for 10 minutes using the mixer until the dough is smooth and elastic. With the mixer still on, add the butter, a couple of pieces at a time, mixing until full combined. Once all the butter has been incorporated, knead the dough at a low speed for 10-15 mins until the dough no longer sticks to the side of the bowl. Put the dough in a large, lightly greased bowl and cover with clingfilm. Transfer to the fridge and leave to rise slowly for 8-10 hours. Next morning line two baking trays with baking parchment. Remove the dough from the fridge and tip it out onto a lightly floured work surface. Diving into eight equal pieces and form into rounds. Flattening each into a disc. Put the rounds onto the baking trays and cover with lightly greased clingfilm. Put the trays in a warm place and leave to prove for about 2 hours until risen and puffy. To test the dough has proved fully, press with a lightly floured finger. If the dough springs back slowly, it is ready for baking, if it springs back quickly, it needs a little more time to prove. While the brioche is proving, make the creme patissiere, take the milk and vanilla extract, place them in a pan and gently bring the milk to a boil. In a separate bowl combine the egg, egg yolks, caster sugar and cornflour in a bowl. Whisk until pale and creamy. Add the milk to the eggs and mix until thoroughly combined, return the mixture to the pan and stir until thickened and all of the flour is cooked out of the creme patissiere. Place the creme patissiere in the bowl, cover it with clingfilm, making sure the clingfilm touches the top of the cream. Place the cream in the fridge to cool. Preheat the oven to 180C/160C fan/gas 4, if using an AEG SteamBake oven add your 100ml of water and choose the SteamBake option and press the SteamBake button and wait for the oven to preheat. Lightly whisk the remaining egg and brush the buns to coat. Sprinkle the buns with pearl sugar and then bake for 15-20mins until risen and golden brown. Remove from the oven and leave to cool on the baking trays for 5 mins, then transfer to a wire rack to cool completely. When the creme patissiere is cool, whip the whipping cream and mix it into the creme patissiere to lighten it. 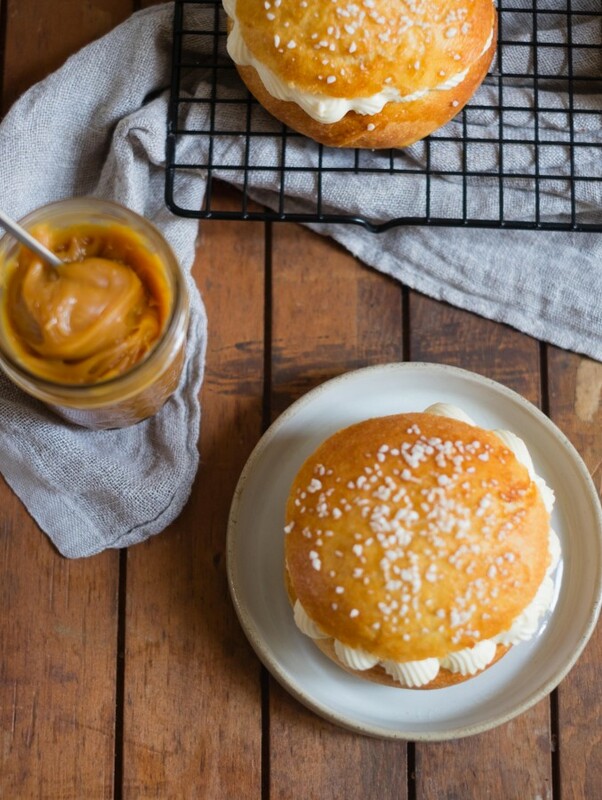 Using a serrated knife, slice the tops off the brioche, pipe a ring of creme legere on the base of the brioche and add a dollop of caramel in the middle. Then put the tops back on and gently press them down. 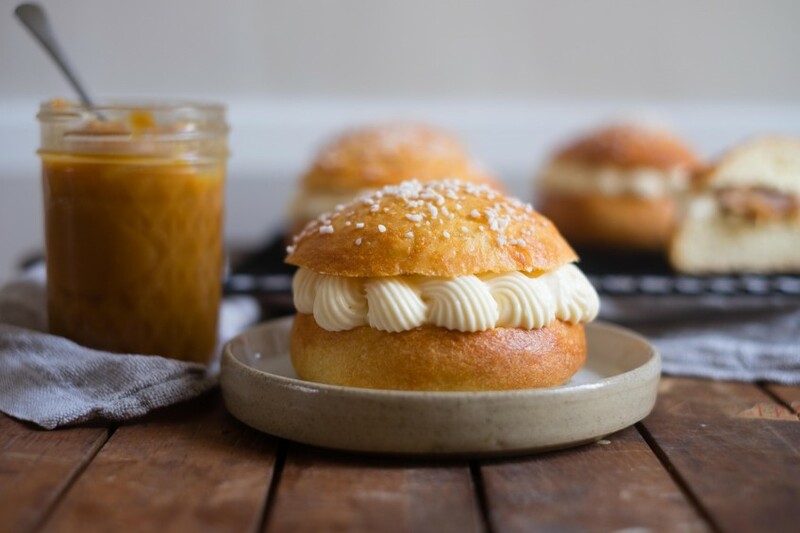 As with all brioche recipes, these are at their best the day they are made, however when left unfilled the buns can be frozen for up to one month. 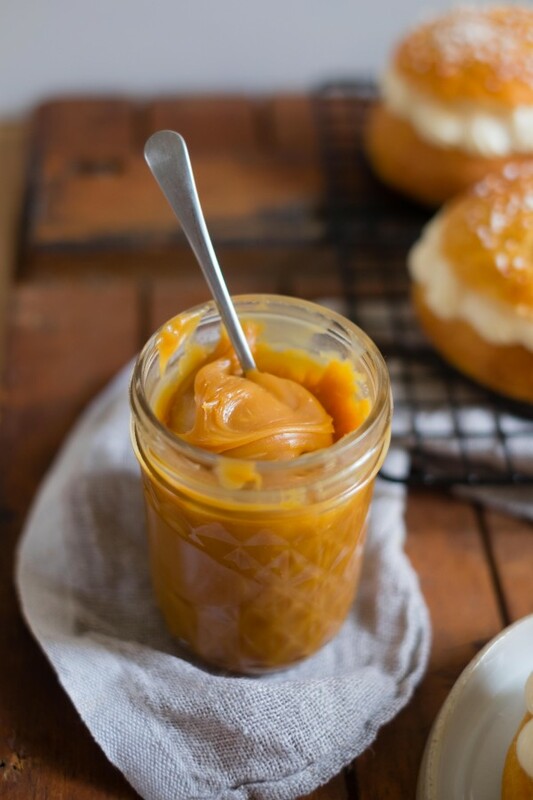 The recipe for the salted caramel can be found at this link. I added a mix of salt and pepper. Feel free to make a normal salted caramel, or to leave it out all together. The pearl sugar I got from Ocado. I made the brioche using my AEG SteamBake oven, and I decided to experiment, by baking one batch of the brioche using the SteamBake technology and another batch without. I will be trying this again with some other pastries and viennoiserie that I have planned to bake. 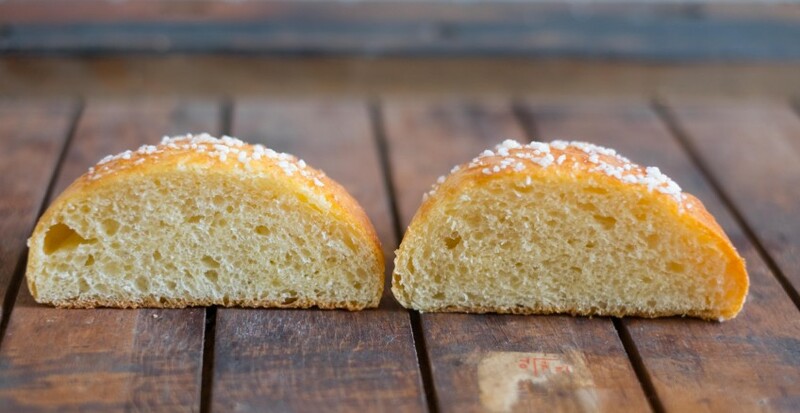 The picture below shows the brioche on the left with SteamBake and the brioche without SteamBake on the right. Although there is not a massive amount of difference in the rise (I think this may be because I proved the dough too quickly, as my kitchen was a bit too warm), there is a definite difference in the evenness of the bake in the one on the left, the crust is better and it was much more aerated than the brioche on the right. I will continue with my experiments and will let you know how my SteamBake exploits go. Well done on the nomination, Angela. Just voted! Best of luck! And really lovely Tropezienne. They’re one of my favourites. I love mine with a coconut lime filling. Totally not traditional! Thank you Debs and thank you so much for voting! Ooh I’ve never had one with a coconut lime filling, that sounds wonderful. I think you call it heavy cream Maggie. You just need to make sure the cream has the highest butterfat content possible, something over 35% is needed. Of course, the tarte tropezienne look and sound fantastic! Love the blog and the photographs look like you could eat them! Thank you so much Georgina. That means so much that you like my blog and the look of my food and photography. Thanks for commenting. oh such a shame, must be the address details. I’ll do the coffee and I have bedrooms upstairs for brits with cookbooks!